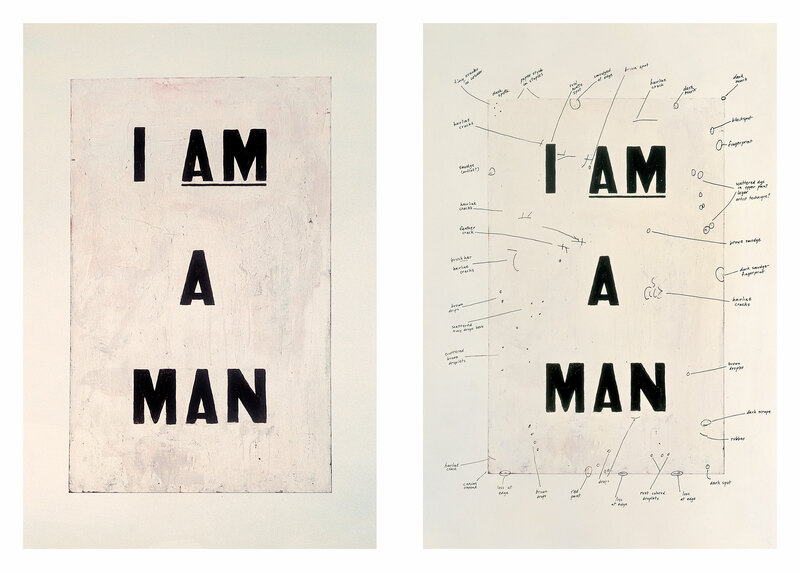 Glenn Ligon's Condition Report uses the strategy of appropriation to point to artists' use of found imagery and to comment on aspects of museum practice. On the left is a reproduction of Ligon's own painting picturing a phrase that was printed on signs carried by black sanitation workers in Memphis during a famous strike there in 1968. On the right is a duplicate print with extensive notations made by an art conservator in what is known as a condition report. The content of these annotations seems unremarkable at first, a kind of neutral inventory dutifully carried out by an art professional. But taken within the context of Ligon's ongoing inquiry into the nuances of language, even these ostensibly objective descriptions have the potential for alternative and more pointed interpretations. There is a subtle linguistic shift toward embodiment, occurring through accrual and rhythm rather than overt declaration, and the print's imperfect physicality feels related to the humanity and dignity of the original speech act it bears. "Condition Report." Take It or Leave It: Institution, Image, Ideology Digital Archive. Los Angeles: Hammer Museum, 2017. https://​hammer.ucla.edu/​take-it-or-leave-it/​art/​condition-report/​.